There was lots of Internet buzz when Will Hodges's was running his Kickstarter campaign for the Tactile Turn Gist ("TTG"). Yes, there have been a few CNC machined fountain pens from other small shop producers too. What sets the Tactile Turn Gist apart is Hodges' design choices for the Gist as well as the ability to mix and match components to build a pen suited to one's needs and tastes. I hummed and hawed for a while before settling with a black polycarbonate body (makralon - same material as the infamous Lamy 2000), damascus steel grip and finial and a titanium EF nib. Needless to say, this review is based on my particular pen since all the different materials would yield different looking and feeling pens. The genius of this pen is in the general design which allows Hodges's to offer up interchangeable parts. I could easily get another Tactile Turn Gist with a completely different set of components, switch them up with parts from my current pen and come up with a new Frankenpen to suit my pen mood of the day. The TTG comes in a slim black cardboard box. The outer box houses a pull drawer that yields the pen nestled in a perfect fitting foam bed. It's a simple and sleek design that is not wasteful. The box does an excellent job protecting the contents while providing a tasteful presentation. The pen itself is features a cigar design with tapered ends and flat tops on both ends. The overall look echoes the Lamy 2000. Except the Gist sets itself apart with finials that can be swapped with those of different materials. In this case, damascus steel. The other distinguishing feature of the Gist is the ribbed body. The ribs go all the way from top to bottom which lends the pen a unique look whilst giving the pen a nice texture and something to grip on. And hence, the name Tactile Turn. I thought that the ribs might bother me but they don't at all. I appreciate the fine texture of the ribs. The finial design echoes the body with fine ribs. On the flat top is the TT logo. Hodges offered the choice of no logo but I decided to keep the logo since it looks kind of cool (to me) and to give the maker some support. I think it would have looked sleeker without it. Apart from the TT logo and the damascus steel finial, it looks pretty stealth in a GTD tactical way. The cap comes off with 2 and 3/4 turns. That's a lot of turns which means there's little risk of it getting dislodged. On the other had, it takes some deliberate action and a few seconds to uncap which can get annoying if I'm using it in a meeting situation requiring frequent capping and uncapping. The threads are on the pen body right where it meets the grip. They are well-cut and smooth. The grip is long enoug that I don't think anyone would ever grip on the threads. At least, I never do. The black clip is made of very stiff metal. I tried to clip to clothes and it doesn't really work. When I clip it to the thin cardboard cover of the Curnow Back Pack Journal, it stayed put. So if you like to clip your pen to a pocket, it might be difficult. If you want to clip it to a cover of a pocket notebook, you should be okay. In my humble opinion, the damascus steel grip is smoking! Damascus steel is a strong steel historically used in sword making! It is a hard steel nowadays used to make knives - highly coveted by the EDC community for sharp blades. I just love it for the mesmerizing swirls! I considered getting the body in damascus steel too but I thought it might be too heavy for my liking, plus, it would cost a lot more! I'm happy with the damascus steel grip as it gives the pen a little more heft. The grip also features the subtle ribbing which only adds to the mad swirls of the steel. It's hot. I also love the texture on the grip. There's no chance of finger slips but the texture is not annoying to hold. The pen is comfortable to hold. I can use it uncapped. The cap posts deep so posting only shifts the weight slightly towards the back. I like the overall weight with the cap posted a little better. This is because it has the damascus steel grip which gives the pen a little more heft to the front which I find balances out with the cap posted. Having said that, I usually prefer to use my pens unposted. With the TTG, I find myself making more effort to post it. But still, far from 100% of the time. The pen uses a black plastic feed which keeps the ink flow going. The nib I chose is a titanium extra fine. I chose the titanium because I never used one before and just wanted to experience it. I heard that titanium is are quite soft and indeed, it's a very soft and wet nib. It's a bit too soft and wet for my taste considering I'm usually a Japanese EF kind of gal. The Bock titanium extra fine nib is no where near EF. I would say it writes like a medium or even broad. This is even before "flexing" the nib. Flexing the nib gives some good line variation but I sometimes find the feed hitting the paper too. The nib is THAT soft. The titanium nib also writes very wet. I haven't found the right "dry" ink for it yet but I'm thinking some of the dryer Akkerman or Callifolio inks would be suitable. The pen writes so wet that I often write pages with the nib upside down! By doing so I can get a finer lines (still not EF though). At first I wondered what I could use this titanium EF nib for. It's too wet for notetaking or quick notes on the run. I thought I would use it for highlighting or emphasis and titles. That seemed quite limiting though. Then at the beginning of this month an idea occurred to me. This pen would be perfect for using with sparkly inks! The converter means I don't have to worry about sparkles stuck on the body of an eye dropper or demonstrator pen. The softness of the nib is perfect for laying down lots of ink to show of the sheening and shading. Now that I have found a use for the pen I feel very happy with it. I should stress that it's not the pen itself but that the titanium nib (which I myself chose) was way too soft and wet for my liking naturally. It's not suitable for my day to day note taking but it's great for creative lettering and embellishment. At some point, I will swap out the titanium nib for a stainless steel EF or F nib and then I'm sure the Tactile Turn Gist would be a great pocketable EDC pen. This is a well-made pen at a great price with so many variations that it's like Lego for the fountain pen world. Surely there is a pen body, finial, grip and nib combination that is just right for you. Tactile Turn Gist is on the far right. Lamy 2000 next to it. Click on photo for more details on the pen line up. How's the inside of the case, does it hug the pen or does the Lx sit loosely inside? It’s a very good question that led me to realize that I should have spent a little more time looking at the case itself in the original review. There is a category of pens in my Wish List which has always been “pencilled-in”. It’s the “luxury European” fountain pen category. The main contenders were always either Visconti or Pelikan to hold the spot in the “under $500” bucket. You may have noted I put Visconti Homo Sapien on the list. But in the back of my mind, I really wanted to try a Pelikan, in particular, a tortoise. The Lamy Al-Star and it’s entry-level sibling, the Lamy Safari are part of most fountain pen users' pen journeys. If you’ve followed my blog for some time, you may have noticed that [two Lamy Al-Stars] frequently make appearances: 2014 Special Edition Blue Green and the 2015 Special Edition Copper Orange. I have yet to do reviews for the Al-Stars but they are on the list. Straight-up, I love them. I find the moulded grip comfortable. The shape of the barrel is sleek and modern. I love the way they write. With this being the 50th anniversary of Lamy Bauhaus design, and being a Lamy aficionado, I was excited to see what Lamy had in store for us. 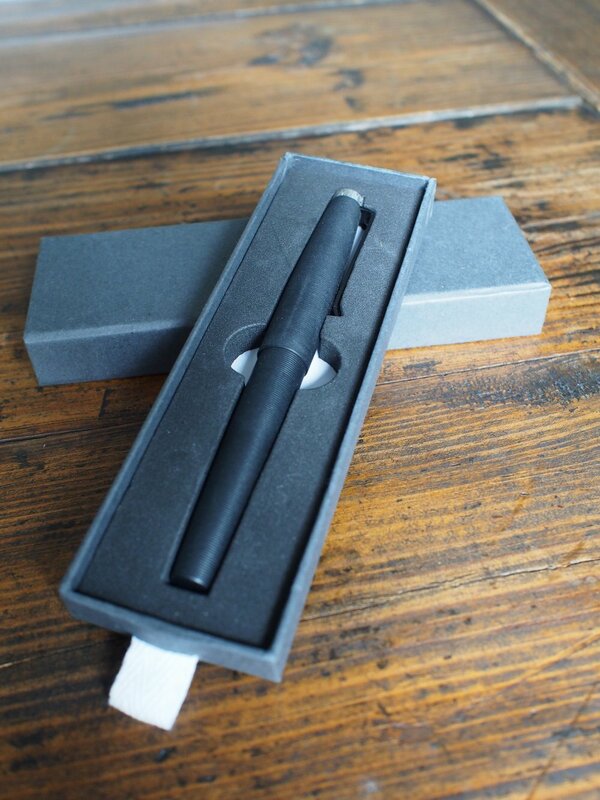 Prior to the reveal, I had put the Lamy 2000 50th anniversary pen on my [wish list]. After the reveal I adopted a “wait and see” approach on the Lamy 2000. I was, however, attracted to the Lamy Lx. So, when the pens hit the shelves at [Wonder Pens], I think 1-2 weeks before our friends to the south, I put an order in for the rose gold version of the Lamy Lx. They also come in ruthenium, palladium and gold colours. This is not intended to be a detailed review of the Lamy Lx but rather, a quick comparison of the Lamy Lx with the Al-Star. There was lots of Internet buzz when Will Hodges's was running his Kickstartercampaign for the Tactile Turn Gist ("TTG"). Yes, there have been a few CNC machined fountain pens from other small shop producers too. What sets the Tactile Turn Gist apart is Hodges' design choices for the Gist as well as the ability to mix and match components to build a pen suited to one's needs and tastes. The Franklin-Christoph Model 45 XLV ("FC45") is the fourth Franklin-Christoph pen to enter my collection. I got the IPO version in Classic Black. Since I got in on IPO (Initial Price Offering) pricing, I decided to upgrade the nib to the Masuyama medium italic 18K nib. I've been writing with this pen for over 3 months now. Pretty early on I knew I had to get a TWSBI. People have some strong feelings for TWSBI: either love for the Taiwanese pen company's smart offerings with advanced filling systems at affordable prices or complete disappointment with the quality issues. I followed the TWSBI discussions and held off from buying for a few months. When I saw the limited edition AL model in Orange being released in spring 2015, I was sold. It looked so good that I had to take a chance with it. So how did my luck turn out with this pen? Read on to find out. I've referred to the Platinum Cool quite a few times in the blog so it was a surprise to me over the past week when I realized that I had not yet done a proper review of it. As I discussed here, this was one of my first fountain pens. At the same time, the Platinum 3776 Century Sai had entered my pen collection without much fanfare. It has, in fact, quickly become one of my favourites in the past couple months. So, I thought I could do a double pen review with a Platinum pens head to head comparison. September 27, 2016 /Kate W.